On the day that my dad and I went looking for lifers in Melbourne, we stopped by a pond where a Common Goldeneye has been reported recently. 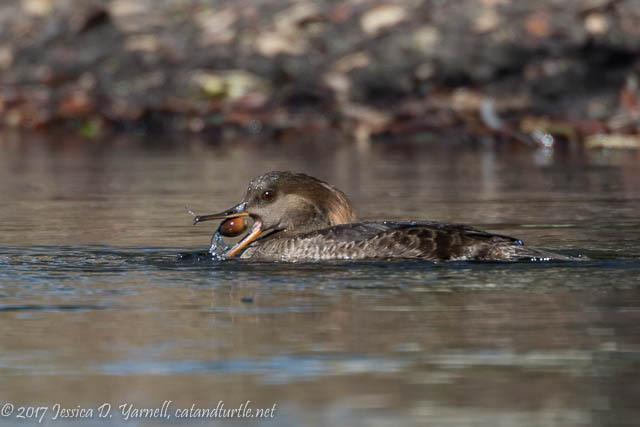 I’d seen a female Common Goldeneye a few years ago in Seminole County, but it would have been a lifer for my dad. Alas, we found the pond and there was no Common Goldeneye – but there were plenty of Hooded Mergansers to entertain us for a little while. 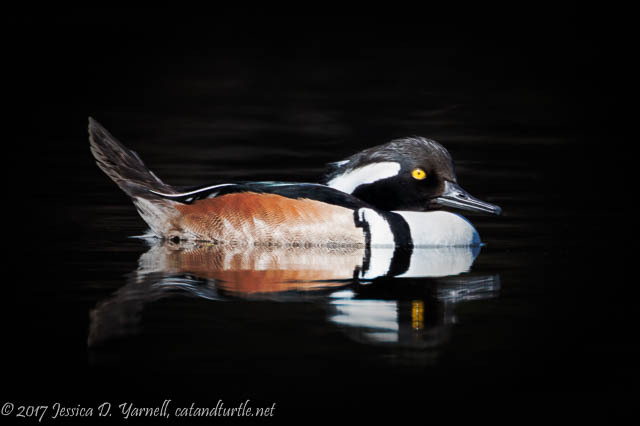 Hooded Mergansers are one of my favorite winter visitors. They seem to have such bubbly, happy energy as they dive in our ponds. I never seem to get tired of photographing them. This afternoon was a particular challenge. First it was harsh mid-day light. Plus the birds were hanging out in the shade, and the cars passing by caused strange reflections in the water. But I was pleasantly surprised by some of my photos. Hoodies are such pretty birds! 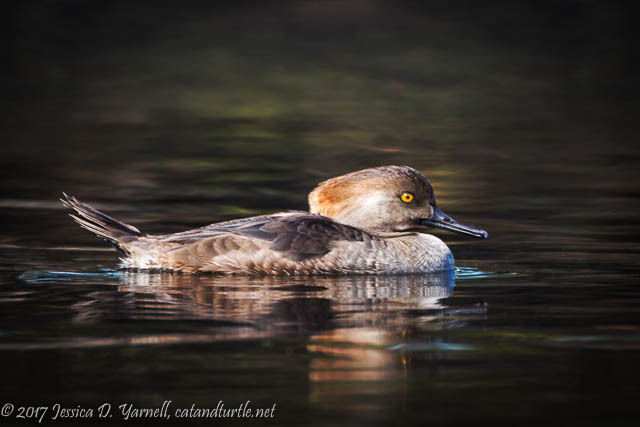 When we first arrived, the birds were sunning themselves and floating lazily on the water. But after a little while, they went into a feeding frenzy. I had to laugh at one female bird who kept bobbing for acorns in the water. She’d come with an acorn in her mouth and toss it back and forth a few times before gulping it down. I was a little surprised to see her swallowing the acorns whole! We’ll have to try again for a Common Goldeneye for my dad. I hope he’s as cooperative as these hoodies! Very nice – the first one is especially pretty.